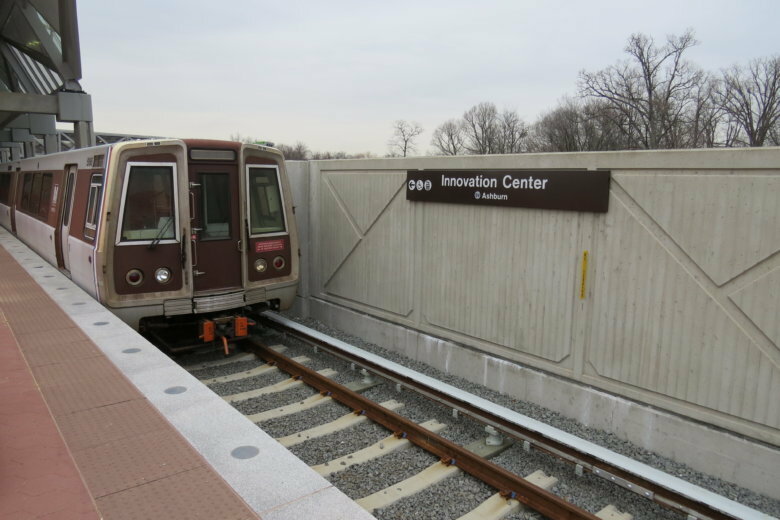 Though there are three outstanding concrete issues for the line from Wiehle-Reston East to Ashburn, only one of them has had a plan approved to address it: The more than 1,000 faulty framing panels at stations. Since December, about 75 percent of those panels at Innovation Center Station have been coated with a sealant meant to keep water out, but work at the other four stations involved — Reston Town Center, Herndon, Loudoun Gateway and Ashburn — is now scheduled to be finished this summer after weather-related delays. The 451 heavy concrete rail ties installed where trains switch from one track to another on Silver Line Phase 2 have angled the rails outward, which could pose a significant safety risk. “We share that concern, and we’re working together to get a realistic look at the schedule,” Metropolitan Washington Airports Authority project spokeswoman Marcia McAllister said. The main part of the Silver Line extension is being built by a private contractor, Capital Rail Constructors, overseen by the airports authority. The airports authority is reviewing its contractor’s second proposed fix for the rail ties, after Metro and the airports authority rejected an initial proposal to insert shims to deal with the problems. “In addition, the contractor … has been working on a root cause analysis, and we are still waiting for the contractor to provide the results of that,” McAllister said. Capital Rail Constructors’ Keith Couch was hopeful the revised solution, which removed plans to shim up parts of the tracks and replaced the clips that hold the tracks in place at the interlockings, would address everyone’s concerns without creating any new delays. “We revised the solution, submitted that solution, and we’re optimistic that we’re going to come up with something everybody’s happy with,” Couch said. Wiedefeld expects a report within the next few weeks from an independent consultant hired by Metro to study the rail tie issue and the potential fixes, which would allow Metro to figure out whether Silver Line service next year is still likely or possible. Metro must eventually accept control of the rail line and rail yard before it can begin months of additional training and testing needed to open the line. “We are going to be very strong that we do not want to take something that solves a short-term issue, and then leaves this board and this region with a long-term issue, in particular financially, so that’s our position we’ve taken, both with the contractor, and with the [airports authority],” Wiedefeld said. The current timeline, including delays confirmed in 2015 and 2017, would have trains carrying riders around mid-2020, so Metro’s budget plan due to be approved later this month includes $37 million in ramp-up costs. If the timeline is likely to slip, the need for that funding would also be delayed. “What we know now is the date hasn’t moved … so we have to assume that that’s still in play, but I also know that we have a lot of things up there that have not been settled yet,” he said. The rail yard near Dulles is being built by a separate contractor for the airports authority. That contractor, Hensel-Phelps, has now proposed fixes for cracking concrete there that would be similar to the protective coating being applied to the concrete panels at stations, McCallister said.